Lawrence Rubin Greenberg Van Doren Fine Art is pleased to present an exhibition of paintings and works on paper from the 50s by Sam Francis (1923 - 1994), on view from November 11 through December 30, 1999. This exhibition will present important early works on canvas and paper from The Sam Francis Estate. It is the first in a series of exhibitions devoted to each decade of the artist’s work. ‘Sam Francis: Paintings and Works on Paper from the 60s’ will be on view at the gallery in April-May 2000. 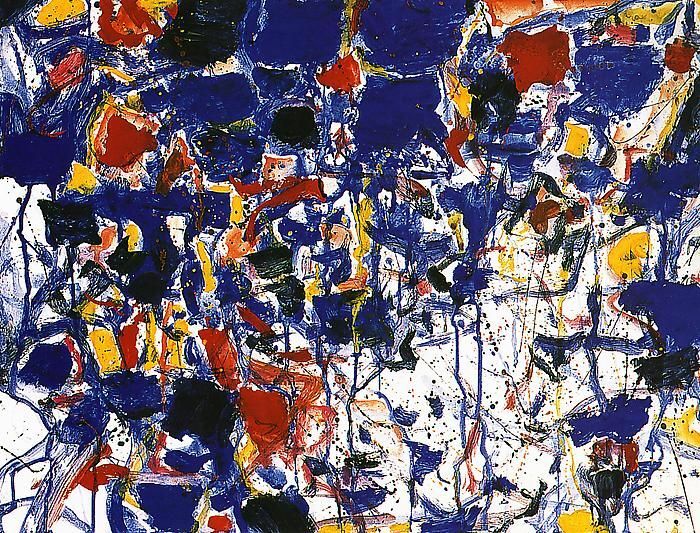 Sam Francis’ art has come to occupy a unique place in the history of post-war American painting. From the outset of his career, Francis developed a distinct brand of Abstract Expressionism which related to contemporary Bay Area and New York School painting, yet defied categorization as either. The artist’s works from the 50s are characterized by fields of transparent cell-like forms and vivid planes of color which dance against warm white canvases. These vastly influential works are exemplary for their emotional heat, lyrical use of color, and delicate but assured brushwork. ‘Sam Francis: Paintings and Works on Paper from the 50s’, will be accompanied by a full-color catalogue with an essay by William C. Agee. A traveling retrospective, ‘Sam Francis Paintings: 1947 – 1990’, organized by The Museum of Contemporary Art, Los Angeles, CA, is currently on view at The Menil Foundation, Houston, TX.